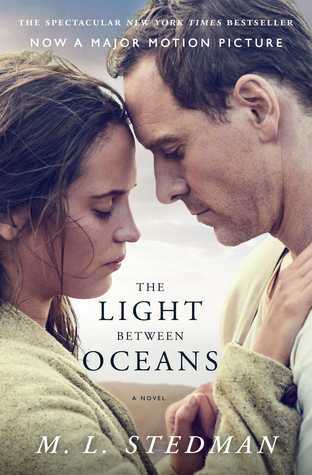 This week The Light Between Oceans by M L Stedman, an author I haven’t come across before. I saw it in a pile of secondhand books for sale and the title caught my eye. On the day of the miracle, Isabel was kneeling at the cliff’s edge, ending the small newly made driftwood cross. A single fat cloud snailed across the late-April sky, which stretched above the island in a mirror of the ocean below. Isabel sprinkled more water and patted down the soil around the rosemary bush she had just planted. ‘… and lead us not into temptation, but deliver us from evil,’ she whispered. For just a moment, her mind tricked her into hearing an infant’s cry. She dismissed the illusion, her eye drawn instead by a pod of whales weaving their way up the coast to calve in the warmer waters, emerging now and again with a fluke of their tails like needles through tapestry. She heard the cry again, louder this time on the early morning breeze. Impossible. A boat washes up on the shore of a remote lighthouse keeper’s island. It holds a dead man and a crying baby. the only two islanders, Tom and his wife Izzy, are about to make a devastating decision. It looks a complete change of reading for me! I’ve not read this, but I have heard a lot about it, and the teasers are definitely good. I hope you enjoy your find! Thanks – hope you do too! I loved this book, Margaret. The Guardian has the film pretty much spot on but the book is definitely worth a read. I hope you enjoy it as much as I did. Thanks, Sandra – I often find the book is better than the film. I haven’t seen the film, but the story sounds really intriguing, if very sad, Margaret. I’m interested just from the bit you’ve shared. I hope you’ll post a review. So far I’ve only read a little bit so far – hope to really get into it before too long. Oh, yes, this book was very popular a while back. I haven’t read it and likely won’t. Don’t think it would suit me very well, but you never know. I’ll watch for your reaction. Kay, I know what you mean – I’m not sure about the ‘cymbal-crashing levels of sentimentality’ that’s in the film – I’m hoping it won’t be too sentimental for me. Sounds like an interesting story. This week I am featuring Deja Moo by Kristen Weiss. Happy reading! Thanks, Kathy – I’ll have a look at your post next. I’m so glad you enjoyed the film – hope you’ll love the book as well. I really enjoyed this book but, for some reason couldn’t get through the movie. Diane, I think the film would be too sentimental for me . I’ve seen this book before and thought it sounded good. but just never got to it. This book appeals to me in spite of possible melodrama. Maybe I need a change from too many murder mysteries. Margot, that was exactly what I thought – I feel like I need a change fro murder mysteries too. I wanted to see the film but didn’t get around to it when it came out. Should probably read the book – it sounds really good! I hope you enjoy it! I read it, Margaret and enjoyed it. I really enjoyed The Light Between Oceans even though it broke my heart. It’s definitely a tear-jerker! I’ve been meaning to watch the film adaptation but it didn’t get the best reviews. Hope you enjoy it too!